"Our Mission is to prevent fires, promote health and safety, provide emergency medical services, protect life and property from fires, hazardous materials, and hostile acts of nature. Department members are committed to serve the public with professionalism, integrity, teamwork, and a never-ending quest to improve services." Bittinger and Accident Volunteer Fire Departments traveled to Northern Highschool today to assist with the Northern Emergency Services Club. 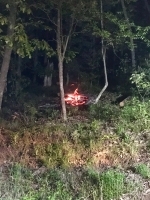 DRY RUN RD - BITTINGER - BRUSH FIRE - - FIRE IN THE WOODS - BR99 T96 1804191 22:27Brush 99 and Tanker 96 responded and found 2 unattended controlled burns burning on the hillside near the roadway. Fires were extinguished and units returned to service a short time later. This site has been viewed 13,095 times.